I never seem to tire of a great pasta meal. If it’s cheesy and meaty, all the better. I love when it can be a one-pot meal. 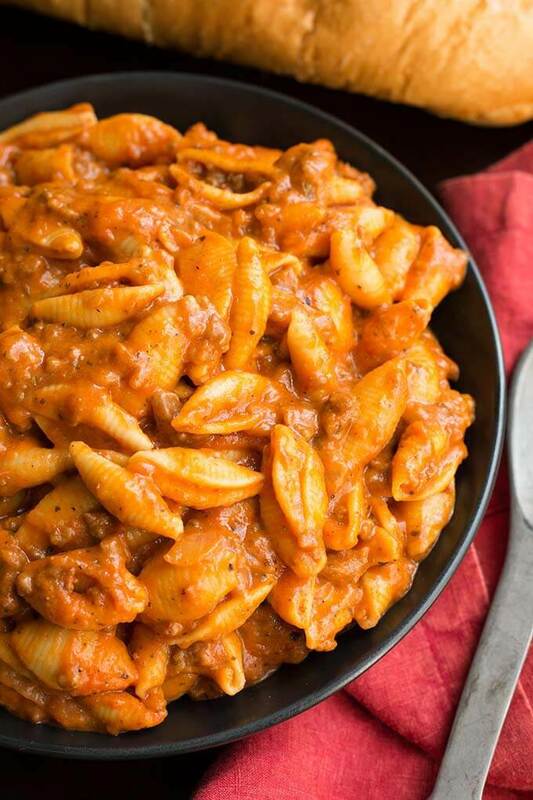 Instant Pot Cheesy Meaty Shells fits the pasta loving bill! Italian seasoning in a rich, tomatoey-meaty sauce, with two kinds of cheese. 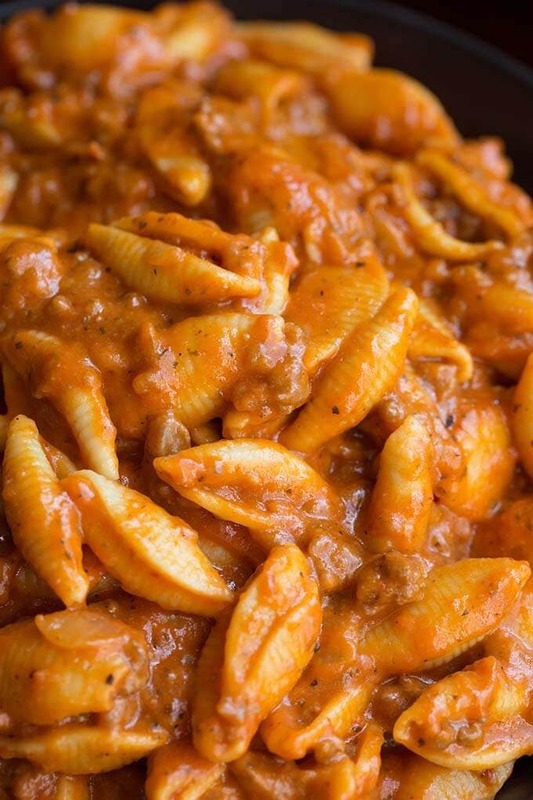 Pressure cooker pasta is easy and delicious! Spring has arrived! I haven’t had to turn on the heat in a few days. The April showers have let up, and the skies are blue! I love cooking with my Instant Pot, but love it even more when it’s warm out and I can cook without using my stove or oven. 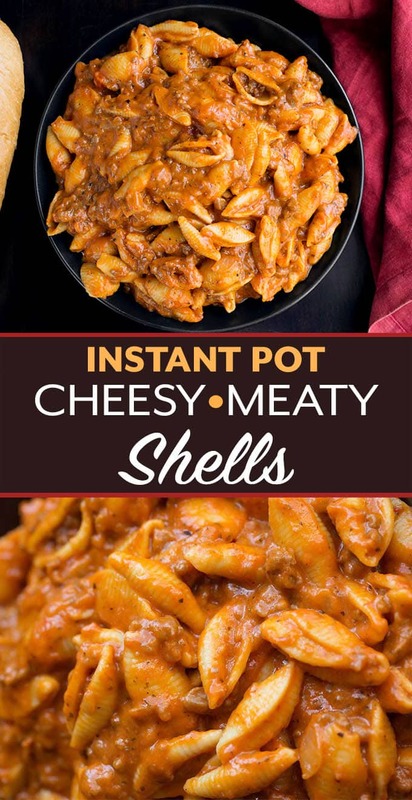 Instant Pot Cheesy Meaty Shells are so delicious, and are a one pot pasta meal. 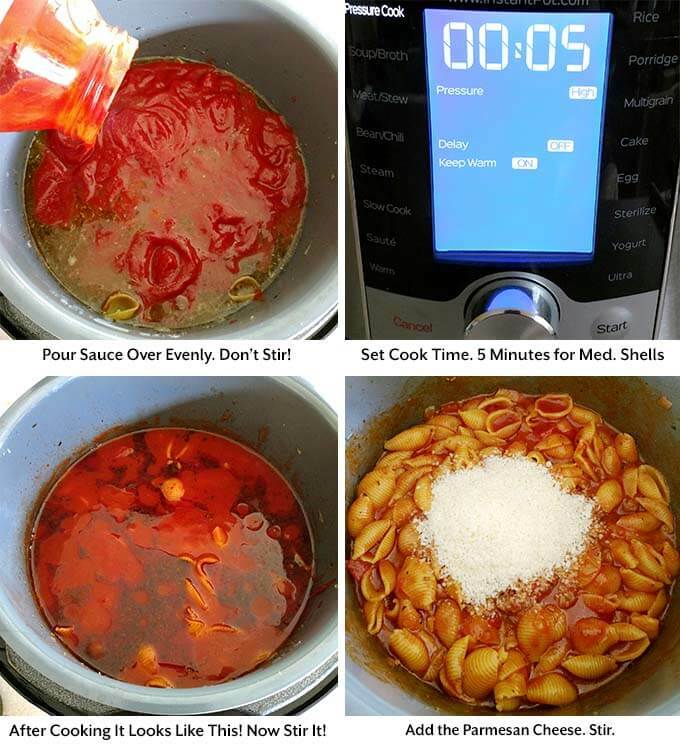 No need to boil the pasta shells separately. They will soak up all of the tasty sauce. 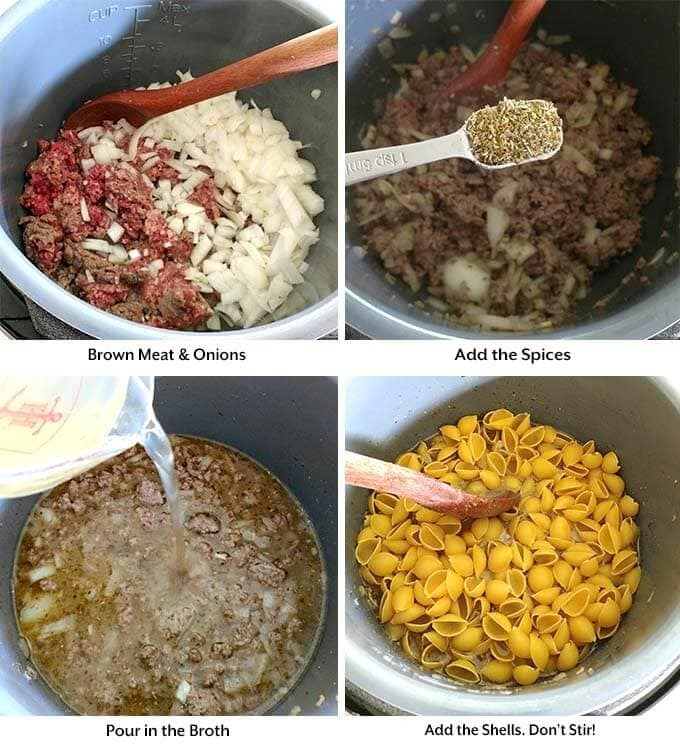 This delicious Instant Pot Cheesy Meaty Shells is not difficult to prepare, and it is so creamy and cheesy! I think your family will love it! I urge you to give Instant Pot Pasta a try. The one-pot aspect of it is wonderful! I have several great pressure cooker pasta recipes here on Simply Happy Foodie! 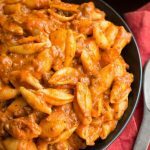 Instant Pot Cheesy Meaty Shells taste almost like a bowl of lasagna pasta! Rich tomato flavor makes the meat sauce delicious. Two kinds of cheese take this pressure cooker Italian pasta dish over the top! Set the pot to Sauté setting. Add the meat and onion. Cook, stirring occasionally, until meat is no longer pink. Add the Italian seasoning, garlic powder, salt, and pepper. Stir. 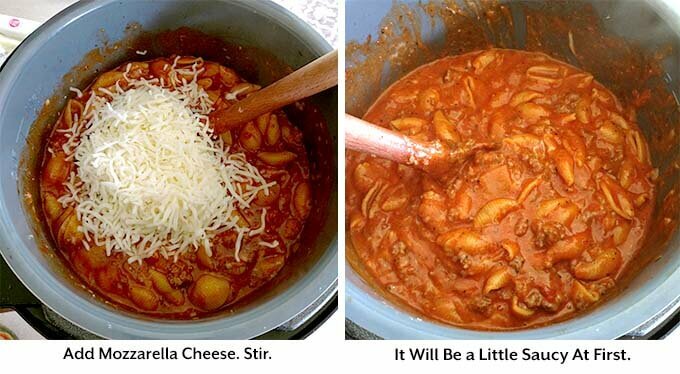 Pour in the pasta shells and spread in an even layer. Press them down into the liquid with a spoon, but do not stir. Pour the jar of marinara over the pasta and cover it completely. Again, do not stir. Put the lid on and set the steam release knob to the Sealing position. Cancel the Sauté setting. Press the Pressure Cook/Manual button or dial and then the + or - button or dial to select 5 minutes. The pot will take a few minutes to come to pressure. When the cooking cycle is finished, let the pot sit undisturbed for 3 minutes (3 minute natural release). If you like a firmer al dente pasta, don't do this step. Do a controlled Quick Release instead. See next step. Manually release the remaining steam/pressure by turning the steam release knob to the venting position, or pushing button, if applicable. Do this in short bursts at first so you don't get sauce spewing out with the steam, due to the force. Once you are sure you will only have steam coming out, you can open the vent fully and let it go. This is called a Controlled Quick Release. Remove the lid and stir the contents. Add the parmesan cheese and stir. Then add the mozzarella and stir. Serve hot, with some crusty bread. Sandy, our family just loved this dish! We used ground turkey, and we added a bit of cottage cheese to the top after serving to give it even more of that lasagna taste, and it was just delicious. Made plenty of leftovers for us to save in the freezer, which we love since we are so busy. Thank you! That’s great, David! Cottage cheese is a great idea for a topping! Thank you for your review!